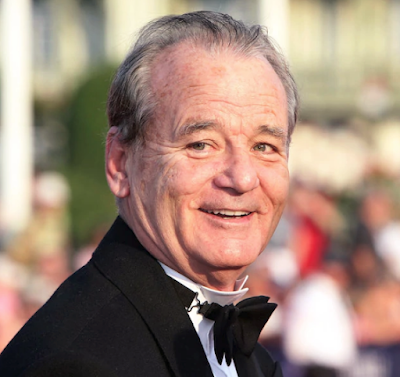 I saw the documentary, "The Bill Murray Stories: Life Lessons Learned From a Mythical Man" (by Gravitas Ventures and winner of a slew of awards. You can catch it on Netflix). It turns out that I'm not the only one with a Bill Murray unexpected adventure. Amongst the many places he has shown up include popping up at parties, looking for a ride at the side of the road, doing dishes at a fraternity, in an engagement photo of a couple, crashing a private party at a karaoke bar, handing out cookies at an airport, and even riding a children's bicycle through Wal-Mart. Well ... I have my own Bill Murray story. I was walking down 6th in NYC. All of a sudden this guy starts talking to me. I look around, and it's BILL MURRAY. We walked and talked for at least seven blocks, including waiting together at corners for the lights to change. I've worked with celebrities, and it's rare -- especially for someone with his wattage of fame -- that they would take that amount of time with some random person. He took this little moment and charged it with meaning. So when someone says, "You're never going to believe who showed up. Bill Murray!" I believe it. The guy is pure enigmatic legend. "Back when Michael Kogen was the proprietor of his little jewel, Piermont (NY) Fine Wine & Spirits, I occasionally filled in for him when he had something else to do. One summer day when I was at the shop alone, the door swung open, and a fellow strolled in with three young boys, all wearing rubber boots. He reached out to shake hands, saying, "Hi, I'm Bill." But he did so by putting his hand behind his baggy T-shirt, shaking my hand with his shirt-covered hand, adding, "Sorry, we were just picking up garbage along the riverbank." Yup, Bill Murray. He bought a bottle or two of wine and went on his merry way. A sweet moment." "Back when Michael Kogen was Proprietor of his little jewel, Piermont (NY) Fine Wine & Spirits, I occasionally filled in for him when he had something else to do. One summer day when I was at the shop alone, the door swung open, and a fellow strolled in with three young boys, all wearing rubber boots. He reached out to shake hands, saying, "Hi, I'm Bill." But he did so by putting his hand behind his baggy T-shirt, shaking my hand with his shirt-covered hand, adding, "Sorry, we were just picking up garbage along the riverbank."